This page will help you adjust the settings of the Language bar and the keyboard shortcuts or "hot keys" you can use to switch between input method editors. 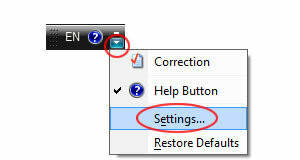 Below you see examples of the Language bar docked in the taskbar (left), and floating on the desktop (right). Click to open the Options menu and then in the menu click "Settings..."
If you don't see the Options menu icon, just right-click on the "EN" (or "CH", etc.) and select "Settings" there instead. show additional icons at all times, even in the taskbar: Help, Maximize (float), and Settings, and also icons for Speech Recognition if you use those. show text labels when the Language bar is floating, as in the example at the top of this page. 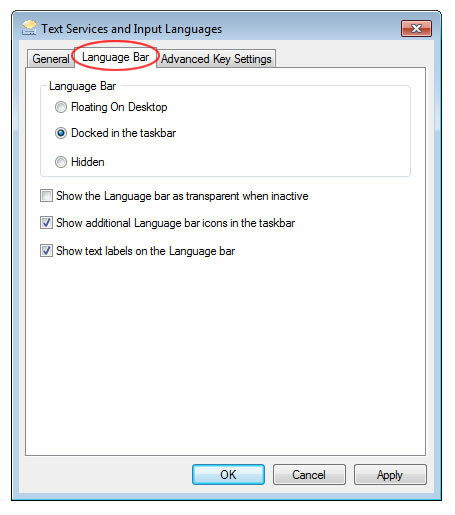 In other languages such as Spanish, labels may also appear when it is docked in the taskbar, but Chinese IMEs only display labels in floating mode. The first item is an option to turn off Caps Lock by pressing the Shift key instead of pressing the Caps Lock key. Just like an old typewriter! (Yes, I'm an Old Guy...). Next are the "hot keys", or keyboard shortcuts, for switching between input languages. I find myself constantly hitting these accidentally so I usually turn them off. But if you are always switching between languages and characters sets, you may love keyboard shortcuts.